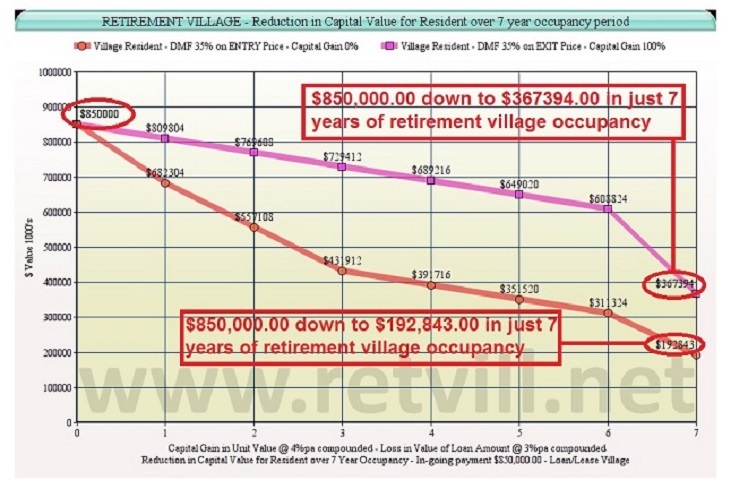 Victorian legislators failed retirees with an inability to fully understand the Retirement Village industry, the Deferred Management Fee business model, operators that defied the law, the regulator Consumer Affairs Victoria who failed to regulate, minister Marlene Kairouz who failed to administer. 43% of Retirement Village residents who purchased in the last five years report no improved life satisfaction and happiness despite their move. In an industry survey by http://villages.com.au 13% of these stated it had actually decreased. 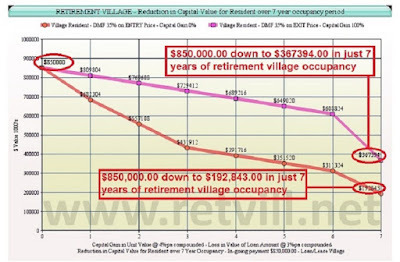 Legislators would you tolerate this retirement village financial disaster for your own mum & dad, why let it happen to any mum and dad. 77% of Retirement Village residents recorded that they are worried about Aged Care funding, this from the 2018 http://villages.com.au National Resident Survey of 19,500 retirement village residents. A senior’s caregiver, such as an adult child, often can find the caregiving task stressful and exhausting. Also, it can be scary when the caregiver is not able to be with the senior 24/7, as is the case for most people. With the cost of nursing home care rising every year to astronomical rates, many are looking for cheaper, but still effective, ways to provide care. One way to reduce costs is to find a solution that allows a senior to stay at their home. This trend of senior care facilitated to a large extent by technology. Here are some tips on how to take it vantage of today’s technology to care for your senior loved ones from afar. Technology such as wellness system trackers and smart home appliances permit remote monitoring of seniors. For example, the Nest camera systems can be positioned throughout a senior's home so that children can remotely check in on their senior parent. These cameras can also send notifications when there are visitors and can be set to alert when motion is detected. The cameras record data in the cloud, which can be configured to archive for a particular period. Live feeds and video files are accessed through a website or smartphone app. It can be reassuring for a caregiver to be able to open their phone and see that their loved one is safe. Other technologies can help with tracking medication by providing reminders to both the caretaker and senior. And technology can help seniors who have dementia, as well. A particularly ingenious app, designed by a 12-year old granddaughter, addresses forgetfulness by setting alerts when it notices repetitive phone behavior - such as calling the same number over and over - and integrates facial recognition to prompt the user, too. Often an Alzheimer's patient recognizes the face of a loved one but cannot call up their name. This app may be an excellent tool for assisting those with memory loss. And technology is not only about keeping tabs on mom or dad it’s also about giving them quality of life. Tablets are so intuitive that practically anyone can master them. Their ease of use enables seniors to play games, listen to music, browse news and stay up-to-date with family and friends through social media. Tablets, smartphone and smart TVs also encourage communication in ways that connect people much more closely than with just voices. Video calling encourages face-to-face interaction between a senior and different family members. Since grandchildren and other relatives can be spread out over geographic areas, the ability for the senior to connect is priceless. A problem with the senior community that is often overlooked is the existence of substance abuse either in the past or as a continuing struggle. Some of these technologies can help by allowing others to monitor activity but can also aid by reconnecting family members who may have been hurt by a senior's prior addiction. Video chat can be a way for old wounds to heal gradually. Like many aspects of our life, technology has the ability to improve senior care. It provides levels of monitoring and connectedness that are almost as effective as living with a senior. These apps and devices allow caregivers to lead a less burdened life, while resting assured of their loved one's health and safety. At the same time, the technology permits a senior to retain the dignity of living on one's own. Until such time that the senior's health requires assisted living, families can take advantage of new technologies for monitoring, safety and more. Any retirement village reforms require two major objectives. ACCESS TO JUSTICE & ENFORCEMENT OF THE LAW. If access to justice is simple & affordable and laws are enforced then bad operators/practices will be forced out of the industry. The reality is you pay it on entry to a village. 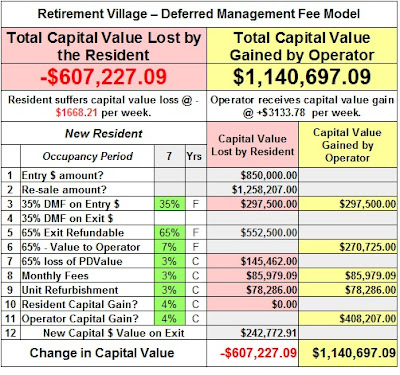 The retirement village industry charges an in-going amount on entry for a lease but not ownership then claims you don't pay the Deferred Management Fee until you exit the village. Hello, you paid it on entry. No cheque is written on exit. Only 37% of Retirement Village residents recorded they felt a valued customer by the village operator - http://www.retvill.net/retirement-villages/retirement-village-residents-not-valued … - This from a http://villages.com.au industry survey of 19,500 retirement village residents. 2018 is a pivotal year in the push for reforms to retirement village laws. The ABC show BleedThem Dry Until They Die brought national attention to long seated problems within the industry. As the cost to simply lease a unit in a Retirement Village moves ever closer to the purchase cost of a commensurate unit within the general community, the greater the Deferred Management Fee model used by the industry fails retirees.